After ten grueling months of ISIS occupation, the ancient city of Palmyra has been liberated. Syrian government troops, backed by Russian air support, encircled Islamic State militants, forcing them to flee into the interior eastern desert. With the extremists gone, experts have had the opportunity to perform a preliminary assessment of the damage inflicted upon the UNESCO World Heritage site. The news is both good and bad. According to Syrian archaeologist Maamoun Abdelkarim, 80 percent of the artifacts in Palmyra appear to be largely intact. There is extensive damage—make no mistake—but many of the iconic columns remain upright, along with several key temples and monuments. Speaking to the LA Times, Abdelkarim said that there’s damage to the streets, baths, and some temple fences, but “the panoramic view that tourists know of Palmyra remains.” Encouragingly, he said that a significant portion of the restoration work could take just five years. 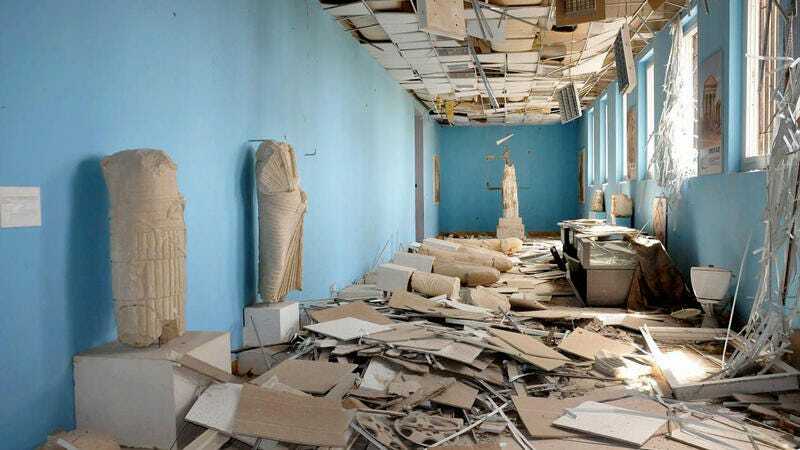 Islamic State militants occupied the historic city last May, and they took it upon themselves to destroy some of the city’s most distinctive monuments, including the Arch of Triumph, the Baalshamin Temple, and the Temple of Bel. They chiseled away the faces of statues and reliefs, declaring them blasphemous pagan icons. The militants also beheaded and crucified Khaled Asaad, a prominent Syrian archaeologist. The vandalism inflicted onto Palmyra, an important stop for traders moving between China, India, Persia, and the Roman Empire during the first and second centuries AD, was greeted with global outrage, leading some to declare the actions of ISIS a serious war crime. Preliminary assessments, some done by aerial drones, show that the Lion of Al-Lat—a 15-ton statue—is still standing, as are the famous columns. Experts will continue to investigate the site over the coming weeks and months as they prepare a report for UNESCO. The area is reportedly strewn with landmines and boobytraps left by Islamic State militants, so the investigation will be slow, tedious, and dangerous. Bomb-disposal crews assisted by Russian engineers and robots will help. The quality and extent of the pending restoration will depend on previous records kept of the artifacts, which in some cases are non-existent or of poor quality. It’ll also depend on the ongoing civil war in Syria, which is now raging in its fifth year. In all it could take about two to three decades before Palmyra is set right.